The primary focus of biological anthropology at UK is the human/environment interaction as it shapes population and individual well-being across space and through time. From this biocultural perspective we envision the adaptive environment inclusive of its natural, social, and cultural aspects. Students in biological anthropology will combine theory and method from biological, cultural, and archaeological anthropology to investigate questions of human wellbeing in contemporary, historic and prehistoric populations as evidenced through health and/or nutrition outcomes. Because scholarly interests of UK faculty coalesce around current themes in anthropology and the social sciences, biological students at UK are provided a unique opportunity to engage in cross-subdisciplinary work. Students will be advised by Dr. Heather Worne, but will also work closely with cultural anthropology and archaeology faculty in the Department of Anthropology and in units and departments across the UK campus. Biological students take a variety of courses in biological, cultural, and archaeological. This includes courses with focuses on Medical Anthropology in the department. They may also take courses that suit their scholarly interests in other departments and units across campus, e.g., Geography, History, and Public Health. Dr. Worne’s current research focuses on the interrelationships among warfare, settlement choice and community health in late prehistoric populations from the Middle Cumberland region of Tennessee. 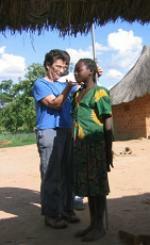 Deborah Crooks measuring a child in Zambia, December, 2005. For more information on the concentration in Medical Anthropology at UK, please visit the Medical Anthropology webpage!